An MBA is a graduate degree in business administration that prepares students for careers in a number of different sectors. Its focus is on high-level business strategy concepts, but most MBA programs offer concentrations in areas such as accounting, operations management, entrepreneurship, finance, healthcare management, marketing or strategic management. What Are the Prerequisites for an MBA in Accounting? Here is the good news for anyone who is interested in pursuing an MBA: No business background is required. Students who flock to MBA programs have academic backgrounds in subjects as diverse as the physical sciences, the humanities, engineering, medicine, law, economics, sociology and political science, among others. Anyone with a bachelor’s degree from an accredited postsecondary institution and a GMAT score obtained in the last five years is eligible to apply. What Kind of Coursework Will You Complete in an MBA Program? If you have no business background, you will likely be required to complete a series of several foundational courses that will provide you with the preparation necessary to succeed in your MBA courses. Economics, organizational behavior, management theory, financial and managerial accounting, corporate finance, marketing, operations management, statistical methods for business and finance, entrepreneurial leadership, business information systems, entrepreneurial strategy, business law and global management. 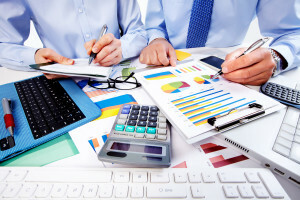 When you decide to specialize your MBA in Accounting, you will also likely be required to complete courses in auditing, accounting periods and methods, personal federal income tax accounting and business income tax accounting, according to GMAT. How Can You Succeed in an MBA Program? Time management is the key to succeeding in any MBA program. Your coursework will require an. Networking is also an important part of your business school education, and will require you to focus on your career outside the classroom. Perform some independent research to find individuals whose professional paths you would like to emulate, create a list of names and contact them by phone or e-mail. You will likely be surprised just how willing they are to speak with you about your goals and to offer advice if you simply ask them. Learning to balance your time between schoolwork and developing professional contacts will serve you well throughout your time in an MBA program and, far more importantly, for the duration of your career. Where Can You Work With an MBA? An MBA will open nearly innumerable professional doors for you after graduation. You will be qualified to work for government agencies; consulting, accounting and professional services firms; banks and other financial institutions; non-profit organizations; healthcare organizations; universities, educational organizations and academia; private and public companies or, if you elect to start your own business, you can work for yourself. Do not delay your search any longer. Submit an application to specialize an MBA in Accounting and begin opening professional doors for yourself today.